Kuala Lumpur, 29 October 2015—From the 27th to the 29th of October, the ASEAN Responsible Business Forum was held in Kuala Lumpur, Malaysia. 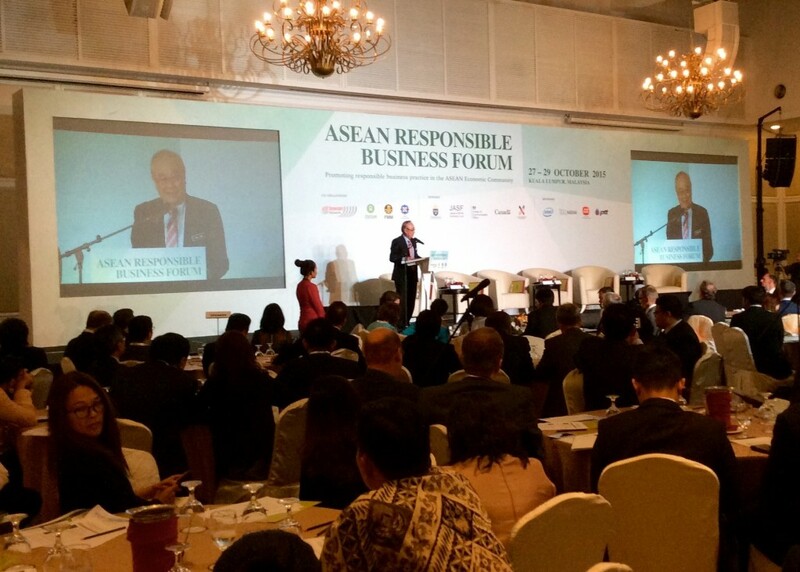 With the theme “Promoting responsible business practice in the ASEAN Economic Community,” the regional platform brought together government officials, civil society and businesses. The multi-stakeholder forum discussed pressing issues and shared best practices of responsible business or Corporate Social Responsibility (CSR). 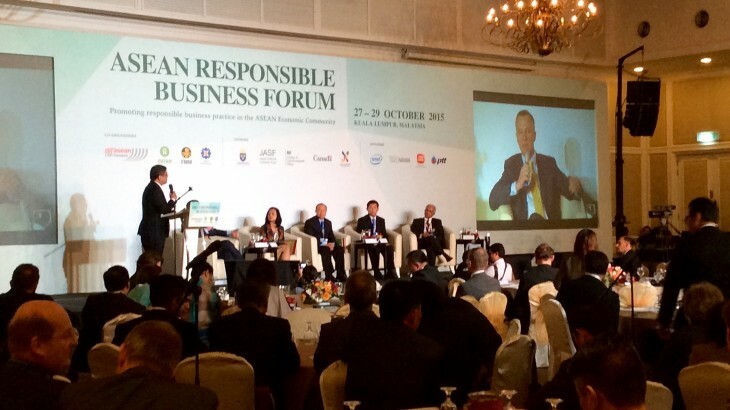 Senator Datuk Paul Low at the ASEAN Responsible Business Forum. “We must go beyond rhetoric,” said Senator Datuk Paul Low. He expressed that business policies should be translated into reality at the ground level and result to change. He emphasized the role of the government in ensuring that assistance is given to those who need it most. He highlighted the need for social justice, human rights, and freedom of expression. Datuk Paul Low said, “We need a very inclusive society.” He noted that there is a need for political transformation in terms of democracy, being open to healthy debate, and accepting criticism. A panel on promoting business responsibility to protect human rights comprised of Tan Sri Dr Muhammad Shafee Abdullah (Chair, AICHR), Rafendi Djamin (AICHR Indonesia), Dato’ Dr. Aishah Bidin (SUHAKAM), Michael K. Addo (UN Working Group on BHR), and Suon Bunsak (Cambodian Human Rights Action Committee). The forum also included high-level panels that discussed building a more competitive and sustainable ASEAN Economic Community Post-2015 through responsible business, new business models for inclusive and sustainable agriculture in ASEAN, and creating a culture of integrity in ASEAN businesses. The event was organised by the ASEAN CSR Network, Oxfam, ASEAN Foundation, and Federation of Malaysian Manufacturers. 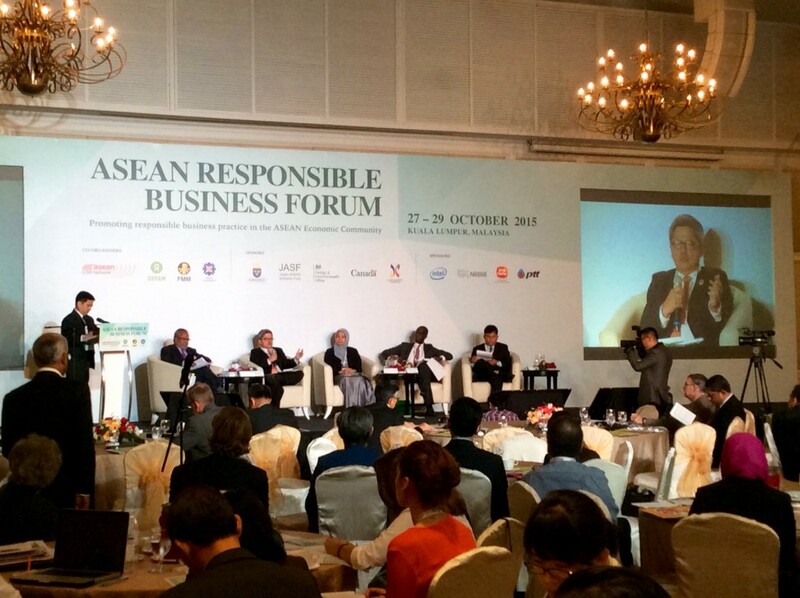 All, ASEAN, Business & Human Rights, Malaysia, News. permalink.